Sterling Silver / 14K Ring 0.26 ct diamondsPrice includes 30% discount. 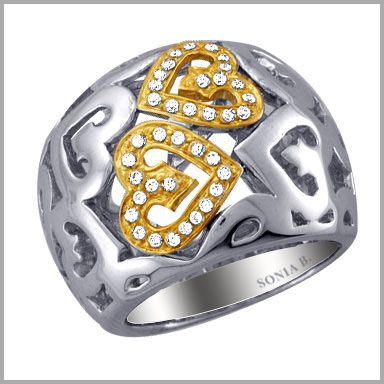 Sterling Silver / 14K Gold Diamond Heart Dome RingSurround your look with a loving aura of sctintillating shine. This dome style ring is crafted in polished sterling silver with two 14K yellow gold hearts at the center. Magically shimmering with 37 full round cut diamonds in prong settings, they also standout against an openwork backdrop of silhouette hearts. The total diamond weight is approximately 0.26ct with a color of H-I and a clarity of SI-3. The setting size is 11/16" x 13/16" with a height of 1/8". Bought this ring from shop NBC a year ago for $450.00. I needed it sized so Shop NBC told me to send it to Tenn. They screwed it up and then I called Sonia's customer service and tried to get a possitive result. I didn't .....I have a mangled ring that was supposed to be my 30th wedding anniverary gift. WATCH OUT FOR THIS SELLER!!!!! !